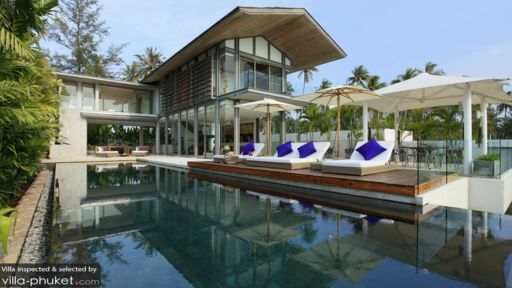 Found near Natai beach in Phuket, Thailand, Villa Roxo is a sanctuary for the tired traveller looking for a respite from the busy streets of big cities. With remarkable ocean views, the villa offers four bedrooms located on the top floor so you can enjoy the scenic beauty of the island to your heart’s content. 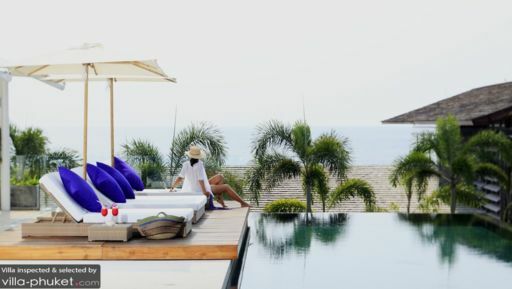 Equipped with plenty of amenities like media lounge, 18-metre infinity pool, and a private office, the villa is great for families and even groups of friends looking for a good time. Make cherished memories here at Villa Roxo, where the five-star amenities and services will leave you satisfied and at peace! All four bedrooms at Villa Roxo are found on the upper level overlooking the pool and surrounding areas. Two of the bedrooms are master suites with private terraces that are furnished with lounge chairs. The bedrooms feature king-sized beds while the other two bedrooms are furnished with single beds. With air-conditioning, the rooms are kept comfortably cool throughout the day. There are TVs for your entertainment that you can enjoy while lounging on the beds. Four en-suite bathrooms accompany the bedrooms either with soaking bathtubs or walk-in showers! With a stunning exterior that breathes modern luxury, Villa Roxo features an 18-metre swimming pool that sports an infinity edge. Surrounded by soaring palm trees blowing in the wind, the pool area is well landscaped to provide a comfortable and refreshing ambiance to guests of the villa. The timber pool deck is furnished with sun chairs for lounging and you can easily take a nap under the tropical sun! Salas allow you to relax in the shade as well if you prefer that over direct sunlight. An alfresco dining area can be found outdoors as well, with another dine-out with chairs and a BBQ. 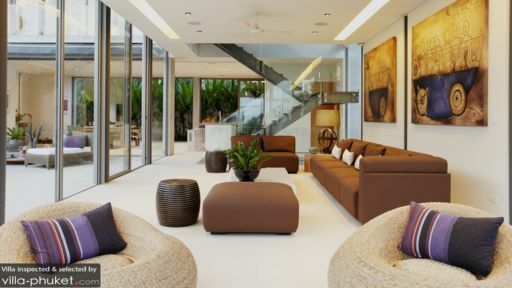 On the same level as the swimming pool is a massive living area, dining, area, and kitchen and just below that is another lounge with a personal office space and en-suite bathroom. The main living room is furnished with comfortable sofas and it is essentially enclosed in a glass room with splendid views of the neighbouring areas including the pool. Sliding glass doors lead to the deck for ease of access. There is artwork donning the walls and natural lighting as well as fresh airs flood the room. The downstairs room is equipped with sofas and a TV for enjoyment. Adjoined to the living room is a dining area that is open from both sides, one leading to the BBQ area and the other towards the gardens. With an eight-seater table in the centre, the dining area is perfect for an intimate meal with friends and family. There is a fully-equipped kitchen as well, with state-of-the-art facilities and amenities for guests. The villa is fully-staffed with housekeepers, security service, and even a personal chef can be appointed based on your preference! With ample amenities to make your stay worth your while, there is something for everyone at the villa. From chauffeur-driven cars that can be made available at an extra cost to massages on-request, guests are spoilt for choice. Bicycles are available complimentary to guests so they can ride around the neighbourhood! Stone’s throw from Natai beach, the villa could not be more ideal if you’re actively seeking a relaxed location. The tranquillity and calm of this particular region will set your mind at ease and leave you utterly refreshed and rejuvenated as you enjoy ocean views, the sandy beaches, and the pleasant tropical breeze on your face!